Monster Cookies – munch, crunch, growl – YUM. 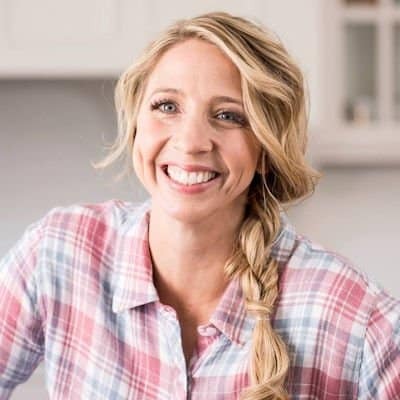 Today as part of my new series called “Happy Thoughts” I will be sharing my favorite recipe for Monster Cookies as well as this fun and creative way to gift it to someone you care about. 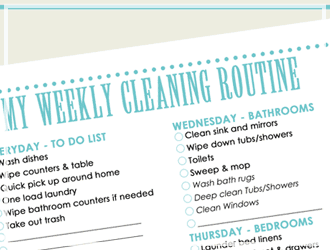 Do you have someone who is always willing to watch your kids when you need them? This person could be a family member, a day care provider, a babysitter, a nanny… or better yet, a manny! I have an amazing mom-in-law and I wanted to do something to show her how thankful I was. I came up with these Monster cookie treats because my children can be “little monsters” at times and it’s almost Halloween. 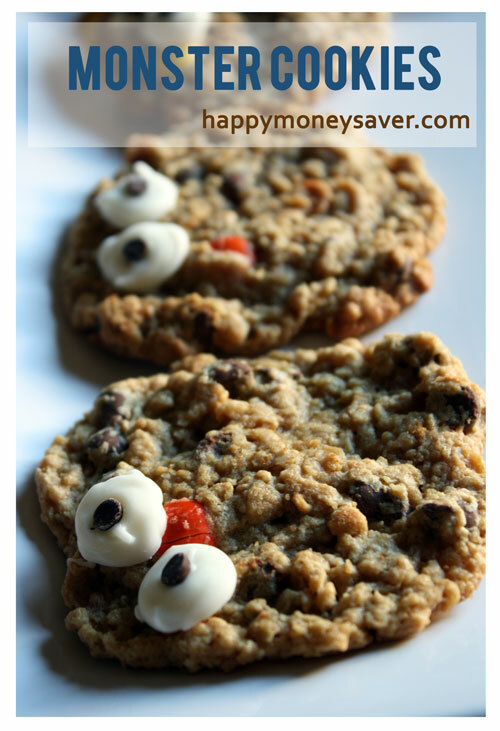 Because I wanted to make my cookies even cuter, I made some edible eyeballs to go on each cookie. 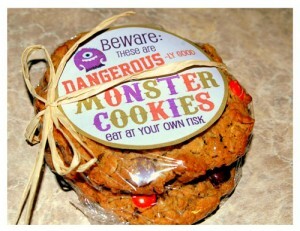 It brings the word “monster cookie” to a whole new level! Look at them! Are they not the cutest little Monster Cookies you ever did see? So to make the eyes, I melted some white candy melts in the microwave by heating them for 30 second increments, followed by stirring, until nice and melted. Then carefully spoon the melty goodness into a squeeze bottle. If you don’t have a squeeze bottle, you could use a zip lock bag and snip a tiny hole at the end. Squeeze onto wax paper to create the white of the eyes. 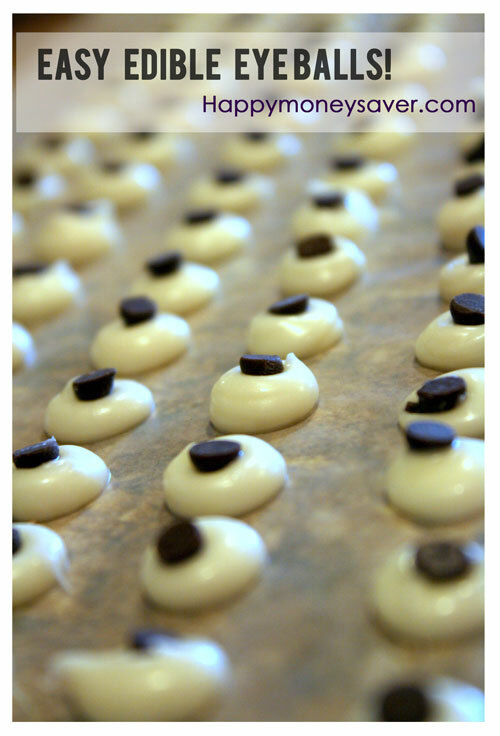 Then use mini chocolate chips and push the pointed end down into the white candy melts. Allow them to cool for 10 minutes or until hardened. They should peel right off the wax paper with no problems. 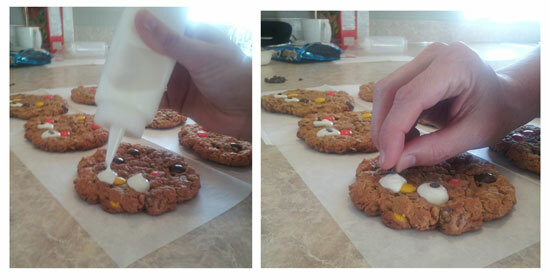 They were so easy and my monster cookies would not have been the same without them! Brings a new meaning to the word “Eye Candy”. 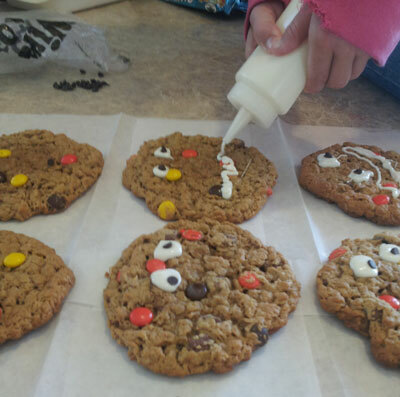 Or you could just squeeze the eyes directly on the cookies too – my kids really loved doing this. They also wanted mouths on theirs…also just as cute. 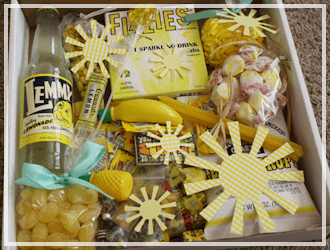 To put this gift together: You can find white candy melts at your local craft store. I found my squeeze bottle at Walmart in the wedding/craft section in a 2 pack for $2.00. The container I used for the gift was pretty spendy. I found it at Craft warehouse for $4.99. Sometimes you can find printable coupons from the craft warehouse website, to make buying a cute container like that a little more worth it. 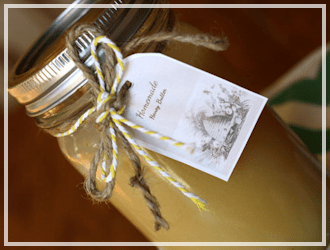 To make this gift less expensive you can use a mason jar, or wrap the cookie in Saran wrap and add the tag. I think this is just as cute! Now if you are looking for the BEST RECIPE for Monster Cookies – we have that for you. Note – in the first pictures we used a recipe that wasnt as good we found online. But my mom had this amazing recipe in her stash and this one turned out perfectly like in these last few pictures. You can click on this image below and you will be able to print it out too. 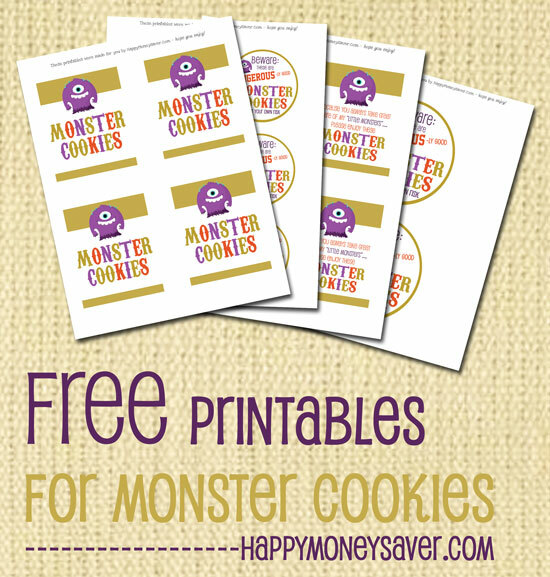 To make this cute gift we have included several FREE MONSTER COOKIE PRINTABLES because we love you so much! 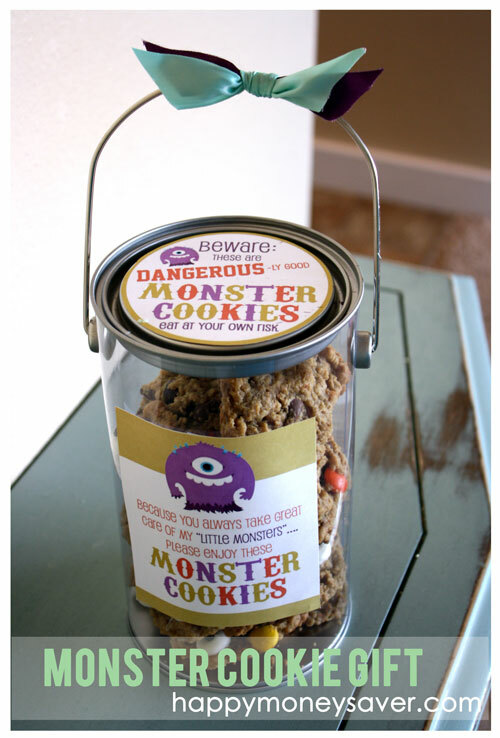 Check them out, we have even created plain tags and labels that just say “Monster Cookies” for those of you who may want to deliver these as gifts to friends, and not babysitters. Happy Thoughts is a series here on Happy Money Saver to help us all become more thoughtful of others. I know it’s not easy but the next time you get that “I should bake something and bring it to someone ” feeling just DO IT – don’t talk yourself out of it. Do this over the next month and watch how your relationships will change. Watch how the simple act of baking some love can open the door to friendships that you never thought possible! Stay tuned for next week’s Happy Thought. See more Happy Thoughts here. Hi Karrie. I can see colored candies incorporated on your monster cookies. Are those m&m’s? Actually they are Reeses pieces! M&Ms could be a good substitute though! My stepmom always made us kids these every year to share at harvest festival at school, add ins were usually peanut butter chips (not reeses pieces) and m & ms so good I’ve to give this a try too! Love the happy thoughts series. Growing up, we would give homemade gifts for someone’s kindness and called them happy day gifts. This reminded of that, so thank you. Also love the recipe. 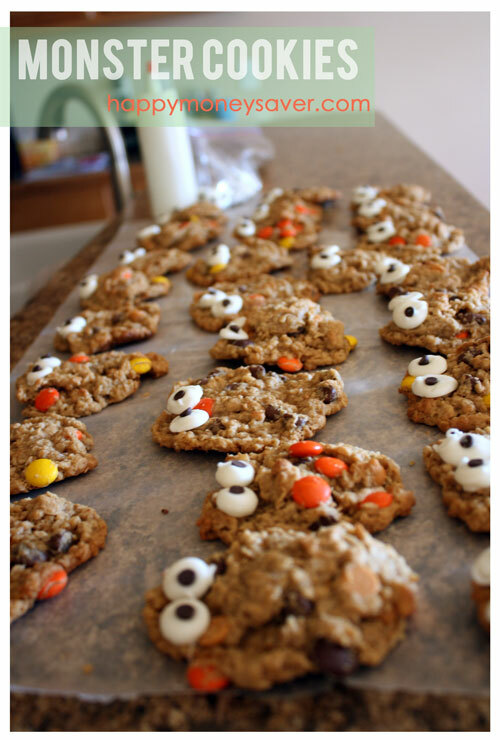 Using gluten free oats, I can make these for my nephew for Halloween. YIPPIE! 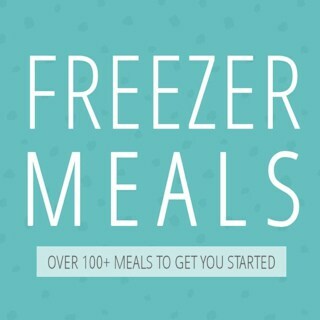 Always looking for more “mainstream” recipes that can be converted to CD without mixing up a ton of different flours or buying special ingredients. Thanks. Sorry, my spell check kept changing the GF (gluten free) to CD. Didn’t catch that before I posted. This has been a recipe in my family for years and is always a favorite for family events. We use M&M’s in ours though. Thanks Barb! This recipe is SOOOO good. And over mixers like me just make the cookies better, ha! Have fun! I can’t wait to make these for my daycare! Thank you for sharing this super cute idea! Having been the recipient of a couple of these Monster Cookies, I can say they are fabulous, addictive, yummy, worth begging for…etc. Yay! So glad you like them Sue!